Regular readers will know what I think the chances of that are. It’s highly unlikely a team will offer the Seahawks an attractive deal for Frank Clark. He’ll cost at least $65m in guaranteed money. This is a sensational draft class for defensive linemen. You could be looking at a $50m difference in contract guarantees. If the Seahawks were going to deal Clark it likely would’ve been done by now. A much more likely scenario is both parties work towards the July 15th deadline and either come to an agreement or Clark will play on the franchise tag. You can’t force another team to make an attractive offer. As for Russell Wilson, it’s even more unlikely. You don’t trade your franchise quarterback without a plausible alternative on the roster. They can’t guarantee a rookie quarterback they like will be available in the requisite range. If they try and trade for someone like Jacoby Brissett, the price will be extortionate because the Seahawks will be desperate. If they believe this is a relationship that can’t last they at the very least need to try and draft a potential replacement first, then exhaust all avenues on a contract extension. Only then would it be right to move on. That’s my take. Yet something isn’t right. Adam Schefter isn’t a rumour-monger. Jack Del Rio has no reason to talk about Wilson’s future. This is starting to remind me of the Michael Silver piece from just over a year ago. He reported that the LOB era was coming to an end after the week-15 debacle against the Rams. Cliff Avril and Kam Chancellor would retire. Richard Sherman and Michael Bennett were on the way out. Earl Thomas could be moved. It was all true — even though many fought it at the time. Schefter isn’t reporting Wilson will go but just consider this. He made an appearance on a Mel Kiper and Todd McShay mock draft show. It was all about the draft. Yet Schefter had his own personal segment dedicated to the future of Russell Wilson. He brought up Wilson three separate times in the one-hour special. His body language throughout was interesting too. Then there’s Del Rio, casually dropping out that Wilson could be moved. His reasoning for it happening was a little flawed and he was a little off on why Seattle has moved on from certain players recently. However — it’s clear there’s talk within the NFL that this could happen. Whether it does or not — it’s still a thing being discussed. And while I still don’t think Wilson will be traded before the draft (or Clark) — it’d be totally wrong to just ignore this. It would be a ground-breaking move. It’s hard to imagine they would do this and then simply hope for the best in the draft without a viable veteran option on the roster. It’s also possible this is just Seattle’s counter in what is increasingly becoming a contract war waged through the media. It’s set to be an interesting few days as that April 15th deadline approaches. Whether Wilson is traded or not before the draft — there’s a reason we’ve talked up Will Grier. He’s a superb downfield thrower who fits Seattle’s offense. If they can’t get a deal done with Wilson before the draft, don’t be surprised if they spend their first pick on Grier just in case they head towards a parting in 2020. The more this gets talked about, the easier it is to imagine it happening. I’m convinced that 99% of these segments are happening because they don’t get to clickbait a trade of a top 5 NFL player most offseasons and the lure must be hard to resist in our current hot-take economy. We have no reason to think either party(RW, Seahawks) aren’t diligently doing their very best to make a deal happen and starting with Cowherd and his irresponsible reporting of an agent’s desires as something that teams are discussing downwards, this has been one giant pile of wankery and mental masturbation by every TV talking head who wants a TRP boost- and yes, Schefter probably likes high ratings as much as any of them. He may not have the racist axe to grind or the vault of bad faith to draw on that the Andy Benoits enter the conversation with, but he’s certainly not Gandhi either. The odds of the Seahawks saying they dont want to pay 35-40 for the guy who’s probably going to be the No. 1 qb in the NFL or close to it over the next 3-5 years seem extraordinarily low to me. I just don’t see any way it happens without the 2 sides actively disliking each other- and thats far from the reality. Temperamentally, PC could go coach for another 50 years and never find a qb who mirrors his own attitude as much as RW does. The synergy between those 2 is just too good to let it happen. Do people seriously think Schefter is doing this for ‘ratings’? I’ve admitted many times I don’t think a trade will happen. Eventually we have to accept the smoke in the room. I don’t think it’s a direct ratings grab or clickbait or whatever, but at the same time it’s hard to have an interesting show that people will listen to without something interesting to talk about, and trade rumors are certainly interesting if nothing else. He certainly got more people on this site to watch the segment than if he hadn’t talked about Wilson, to maybe put it in another way. I’m sure there’s some smoke connected to it, but I’m not convinced it’s anything major or more than we already know. At most this feels like the push-pull of negotiations leaking out a bit. I feel like it’s more that guys like Schefter are commenting because it doesn’t look quite like all other team-QB negotiations. I never got the sense, for example, that guys like Stafford, Luck, Big Ben, Rodgers, Cam, Brady, Brees, etc., were even possibly going somewhere else. The teams just handed over whatever $$ was necessary to keep them. Doesn’t feel the same here, and national media are probably getting an inkling that this thing could really happen, that a team could let an inarguably very good QB go because he just wants more than they are willing to pay. I agree, this feels different. That’s possible, but I do think there is a bit a bias on our part. Had we followed those teams contracts as closely as we do ours, then perhaps it might have felt different about the other negotiations Most of the neutral sites where there’s other fanbases I visit don’t seem to think Russell is going anywhere. But the segment hasn’t even been clipped by ESPN. It hasn’t been talked about by PFT. Schefter hasn’t even tweeted about it. If I hadn’t watched the show and clipped it myself (I created that Youtube video) — we’d never know it existed. I’m a BBC broadcast journalist. I know when someone is doing something for clickbait and when someone is trying to tell us something. Schefter wasn’t just going for a ratings boost there. No way. Like I said, I don’t think it’s clickbait. I just think it’s a topic that he found interesting and figured it would make for good conversation on his show. Which there’s nothing wrong with that, but I just don’t see the significance of it as being all that great. And presumably Jack Del Rio ‘just found it interesting’ too? Come on man. I don’t think he’s getting dealt but let’s not act like this isn’t a thing. I mean sure, to some extent. I’m not quite sure what sort of ulterior motive JDR would have in this game. Is he trying to do his buddies John and Pete a solid by spreading media pressure on Russ? Seems kind of farfetched. I acknowledge the fact that Wilson could be dealt, and I agree I don’t see it as likely. I’m just not sure what sort of ‘thing’ I’m supposed to be convinced of here. Jack del Rio is simply relaying what is being talked about in NFL circles. That Wilson could be dealt. As others, like Schefter, have alluded to. It’s not complicated or difficult. Doesn’t mean a deal will happen. Just means people in the league think it could. And that should be acknowledged and respect — not shot down because people find it difficult to hear. Fair enough. Like I said, I acknowledge and respect the possibility. I just don’t see it as any more likely than it was previously. Negotiations are heating up and all options are being explored in the push-pull. Not much seems to have changed from that. Rob do think the Hawks will have to stick at 21 if they want to take Grier? Rob you know what they say, when there is smoke there is fire. About Wilson, I really don’t think he will be moved unless the Hawks get 3 first rounders plus, which I just don’t think any team would give up in addition to making him the highest paid NFL in the league. Maybe the Vikings if they thought he was the missing piece and worked out a trade of cousins or something back to us or to another team. However, Clark should have quite the market. Young pass rusher entering his prime, almost no injury concern. Yes it’s a loaded draft and yes he had to get paid but teams will always pony up picks for young pass rushers in their prime, that is just how it is. Plus, the Hawks need picks and being able to add a second round plus maybe another will be too attractive to JS to ignore I believe. Use their first on a potential great dline prospect, use the new second on best available WR, and let the rest of the draft come to you. Fun to imagine possibilities of staying put in first and having a second round pick. When you can easily get a top rookie DE in this class for $15m guaranteed instead of $65m, you won’t have a good market for Clark. And next years potential QB class will also keep any motherload haul for Wilson in check. Respectfully I think you might be under rating Franks value on the market. Can any team draft a rookie DE with the hopes of them being a top dlineman while 15 mil instead of 65 mil? Yes. Every other team has the same question. They have a chance to draft a DL with club control for five years at a bargain price. They will take that every day of the week and twice on Sunday over paying Frank Clark — who isn’t elite yet — $65-70m guaranteed. And if anyone was willing to make that deal there’s a decent chance it would’ve been done by now. Maybe it is and the team we are trading with is waiting for the draft to fall to them in a specific order to initiate the trade? My $.02: Forget the Giants. I don’t think Dave Gettleman has a single iota of interest in a RW deal. His front 7 is a mess and his OL isn’t great, either. Think Montez Sweat is exactly his cup of tea at #6, and they will likely pick the best lineman on the board at #17 (LB a possibility if Bush is still around). Maybe next year for RW, but I think they are all in on Eli for this year and realize the lines are bad. Agree completely. I have no doubt Russ would love to go to NY but I think any Giants rumors are coming from the Wilson camp. Gettleman has never given up a 1st round pick in his history as a GM. I think there is almost a zero chance he is traded to the Giants this year. I personally doubt there is even a big market for Wilson why would any team give up multiple first round picks for the right to do something the Hawks don’t even want to do in giving Wilson a market setting contract. What teams have the draft capital and cap space to do that deal? I don’t see any good fit really particular before the draft. Dude doesn’t play football anymore. Haha, Rob with the quick rebuttal in Kaep. But really (and sorry Rob) the Hawks showed interest a couple years back in him for a backup QB but he wanted more $$$. They also liked him in the draft. There’s no smoke around Kaep, but if there’s smoke around this potential trade then you know the Hawks will leave no stone unturned when analyzing potential options for life after Russ and somewhere on that list (IF there is a list (assuming the Hawks would entertain a trade)) I guarantee Kaepernick is one of the select few alternatives to fill the hole at QB or at least some real çompetition for Lynch… As a hedge. And am I the only one who thinks Lynch might be more than a scrub. I’d argue he never got a fair shake with his prior clubs and their coaching carousels. Maybe, just maybe the Hawks think they’ve got something. Maybe kinda maybe. I do not share your take on Kaep (I don’t think he would be on any short list of hedges) but I do agree that Paxton didn’t get a fair shot with Denver, and think we could have something with him. He could thrive in the right system, I liked him coming out of college but never liked the fit in Denver for him. I liked him in his Draft year, lots of potential. But, got to say …Hmm, he didn’t get a fair shot? As I recall he lost out to Trevor Simian. Twice. Not encouraging. Re Kaep, he hasn’t played ball in two years, and had flaws when he did play regularly, it’s not like he has improved since then. Kaepernick isn’t coming to Seattle. He had his chance when they were the ones to give him a chance and he blew it. I really don’t understand the RW trade talk. Yes, three first rounders is appropriate compensation, but who is going to play QB for the Seahawks? Who gives them the best chance to win a Super Bowl next year? A trade with NYG will send Eli and Hawks then still have to use a pick on a QB that may or not pan out. If they don’t pan out, your stuck in no mans land. RW gives the hawks a chance to win a Super Bowl for several years and is someone you build around. An angle I’ve been thinking about on a Russ trade – what kind of team would realistically be trading for him? We’ve seen the Giants connected the most, as they have a bevy of draft capital and are a big time market. What I haven’t seen discussed in these scenarios though is that by trading for Russ the team acquiring him is seriously hamstringing their future ability to build around him. If the Giants were in theory to give us two firsts this year, a first next year, a couple seconds, etc. then that’s 4 or 5 less chances they have to acquire affordable high impact talent during their window with Russ – who will also be hampered by his new market setting contract. Its tough to figure out what sort of rebuild NY is taking on – they have improved their o-line, have a generational running back, but also just traded their best offensive player and have dismantled their defense. In my mind, they are not a team that is a Russell Wilson away from being a contender. Going down that thought line, what team would benefit from giving up multiple 1st/2nd round picks to put them over the top? All the teams that are in theory one piece away likely already have a franchise QB – Atlanta, New England, Chargers, Dallas, Colts, etc. I guess I’m just spit balling here on a train of thought I haven’t seen come up too much requiring the ultimate cost of acquiring Russ. I’d argue that NY would have a clear direction in their rebuild. Odell was a headache and very expensive. Maybe the Giants had a bit of buyers remorse after they signed him. And moving him gives them room for another big time acquisition, yet their free agency has been quiet. Imagining RW with Barkley is easy to see. The athletic profiles and combo as a threat on the ground is what could make them a really lethal combination. So you give Seattle this ransom, but how do they build around him now that they’ve traded their picks away? Well, by making the move you’re betting your future picks will be late firsts. Rob has also made the point it would really boost season ticket sales and merch. Perhaps they too believe in two or three years Wilson’s contract won’t look so bad comparatively to Mahomes and others. Every reason we have is just as much theirs for why they should trade for RW and more. It’s a bigger market for one. So why should Seahawks then part with Wilson given all the reasons I say above? Every team is built differently and have different identities, as well very different markets. So if New York values wilson more than we do, e.g. they are prepared to make an enticing offer to acquire and sign him, then itll happen. NY is confident in their ability to draft around Wilson and contend now, SEA is confident in their ability to draft and develop a QB in this scenario. After all, they’ve only drafted Wilson and mcgoo. You’re not wrong here Eli. Giving up a ton of capital, needing a QB and having the cap space to do it limits potential trade partners quite a bit. A team like Miami has the cap space and the QB need, but not the draft capital. They do have some good pieces though. Their Tackles were the highest PFF graded duo (Laremy Tunsil and Ju’Wan James), Minkah Fitzpatrick was a first rounder last year and graded really well out of the slot. They have Mike Gesicki (2nd rounder last year)at TE, who a lot of us liked last year. Maybe that’s a framework in some combo of T/NB/TE/Picks? Throw in Fitzmagic as the bridge… still that’s a tough sell in my opinion. RW has more value to us than any other team, simply because we don’t have to give up anything except cap space. As much as I really don’t love the idea paying him North of $35M due to the ripple effect of costing us other players as cap casualties, I don’t see a ton of suitors that have that perfect storm of need, picks and cap space. Regardless, this doesn’t look like it wants to be over any time soon. I get the feeling we’ll be right back here next year talking about this same topic. Ju’Waun James signed with the Broncos in free agency. Mike Gesicki was shockingly bad. I don’t know why the Seahawks would want him unless they tried to kid themselves again, like Dion Jordan. I realize rookie tight ends tend to start slowly in the NFL. But with Gesicki it was far, far beyond that. It often looked like he had no business on an NFL field. He has such a bizarre frame and so many klutzy aspects to his movement that often the defender’s biggest problem in guarding Gesicki was not to laugh. I’ve never seen anyone whose SPARQ numbers are total opposite to how he moves on an NFL field. Many Dolphins fans want to give up on Gesicki right now. Others simply hope he can be an occasional specialty piece…like jump balls. He gives no indication he can run an actual route tree on the pro level. I’m disgusted because Dallas Goedert was right there to be had yet somehow the Dolphins preferred Gesicki. The high value pieces on the Miami roster are Tunsil and cornerback Xavien Howard, along with Minkah Fitzpatrick. Anyway, from a Miami perspective it would be hilarious if Russell Wilson somehow ended up with the Dolphins. Talk about fans suddenly forced to do an immediate jump shift. An overriding argument on Dolphins forums for years has been that there is no difference between Russell Wilson and Ryan Tannehill other than caliber of surroundings. I wish I were kidding. And it was hardly an occasional or mild topic. Many posters based their entire existence on those forums on that theme. They actually argued that Tannehill would win Super Bowls galore with the Seahawks and that Wilson would fare much worse with the Dolphins than Tannehill ever has. Many of us laughed at them but they wouldn’t surrender. Just the opposite. There has never been a greater disconnect between ability and reputation in Miami sports history than Ryan Tannehill. Now those posters are stunned that he is gone. Several months ago I posted on those forums that reality tends to show up in dramatic fashion, and in this case it meant the Dolphins trying to figure out how to get rid of Ryan Tannehill simultaneous with the Seahawks trying to figure out how to pay Russell Wilson. As Rob has posted several times, the Dolphins appear determined to undertake a major rebuild and look toward 2020 for a new savior at quarterback. They only had 59 players on the roster until recent days, when they frantically signed about a half dozen AAF refugees. The Las Vegas futures odds on the Dolphins are higher than any team in the league for 2019. Dolphins fans are resigned to a tank or semi-tank season. It would be a bizarre jump shift to suddenly pry away Russell Wilson, with otherwise such an untended roster. Frankly, I hope Wilson remains with Seattle. But I am reminded of his sudden shift from North Carolina State to Wisconsin. That is more commonplace now but Wilson was one of the early high profile examples to take advantage. It always made me wonder about his loyalty as opposed to wandering eye and determination to self benefit. Awsi – regarding RW’s “sudden shift” from NC State to Wisconsin, it’s my understanding from what I have read that while he was at NC State, RW signed a contract to play baseball professionally and he then had conversations with the NC State head football coach about the coach’s concern that this somehow reflected poorly about RW’s commitment to his football future at NC State. The coach and RW were unable to reconcile their differences and RW was then able to find a willing suitor at Wisconsin. His commitment to football at Wisconsin included being voted the team’s Captain, as I recall. So, RW’s actions in leaving NC State don’t appear “sudden” to me nor do they somehow make me question his current loyalty to the Seahawks. On the contrary, I think I’m one of many who have found his support for the team and the Seattle community exemplary. What happened was Wilson signed a contract to play baseball and wanted to go and give it a try to see if he wanted to be a baseball pro. When he finally decided he wanted to stick with football, the NC State Head Coach said they’d committed to Mike Glennon and were moving forward with the younger QB. So Wilson, a graduate, was able to consider going to Wisconsin or Auburn and chose Wisconsin. A little over two weeks until the draft so time to make my rash prediction. Josh Rosen is going to be the next Seahawks QB. John Schneider will trade a 2020 second round pick to AZ. Gross. Schneider’s not that stupid. I’m more concerned about finding a way to get 4 picks on day 2. Rob, if Noah Fant drops to 29 while we are there, do you see anyone wanting to jump above Green Bay (assuming they didn’t take Hock) and New England? Maybe Houston or raiders? Anyways Houston gives us their 2 2nds for 29 (similar trade value)? No Houston won’t trade their two second rounders. I don’t see teams trading up for Fant. Rob, since you use the site to explore draft scenarios, what do you think it would take to get the Seahawks to trade Wilson? Not going it’s going to happen. Just a ‘what if’? I’m going to throw out an idea that I hate, but sounds like something that ‘could be’ tempting if the Seahawks know they can’t get Wilson signed before the franchise tag. You may think this is not realistic, but I’d be interested to hear what you think would be possible. Wilson to the Cardinals for AZ 2019 R1 (1), R2 (33), R4 (103), and Josh Rosen. Seahawks pick Nick Bosa at 1. Would absolutely hate it. Worst case. I personally think Raiders are a good landing spot. Idk the details of Carr’s contract though, and if they can move him or not. But I know Gruden loves RW. Take Carr, 4, 27, 35 and 2020 1st. Leaves them with a first this year still, then we play the year with Carr and see how he does with PC. All goes well in our system, perfect, before last year, he was seen as a solid starter. If he doesn’t fit then we draft a QB next year. I know there are questions about the class, but it is pretty deep i feel. Tua would be smart to declare, Fromm, Herbert, Montez, possibly Eason, and Hurts. The Hawks would never trade Russ within the division, but even theoretically… would not take Rosen. If they had the #1 pick (with other draft capital) they would surely rather take Murray. Oakland might be a fit except they have no money. NYG would probably be the obvious trading partner (theoretically) unless you maybe wanted to think about the LA Chargers (if Rivers was also cut). No, you don’t trade him within the division. We don’t want Rosen either. I just want to crawl into a fetal position with a bottle of vodka and a carton of cigarettes until this drama is over. Whether Wilson or Clark are traded or resigned, no matter the outcome, I’ll just be happy when we can all move on to something else. Yep. Agree 1000% I’ve already spent way too much time reading and thinking about those subjects. Seems to be a horrific waste of time to be spending so much time on this right now. I would much prefer just to talk about Trade down scenarios and our own potential mock drafts. Three first-rounders. Two firsts, two seconds. Something like that. At this point I’d probably do it. Been a good run, but all good things must come to an end. Haven’t looked like seriously competing at any point in the last few years, and it’s hard to see that changing in the next couple. Maybe you steal another one like the Giants managed a decade ago, but apart from that? Seahawks look like they’re settling in for a period of Rodgers-Green Bay stagnancy with Wilson. Would always prefer that to the trainwreck so many other teams are, and it’s easy to take success for granted, but if someone feels like dealing with the salary they’re welcome to it. I desperately hope I’m wrong. The other day on 710 Tom Wassel was chastised for suggesting that Wilson may be paving the way for his exit. Many commentators including those close to Wilson took issues with him and called the notion ridiculous. I hope it is too. But there are some factors that seen to jive with this notion. -The new York/ciara story didn’t come from no where. -Seattle is a great market but it is isolated. Russell is clearly about building his brand. Always had been. He wants to be a star in the grandest stage. An east cost market like NY would be ideal. – Wilson is good friends with Alex Rodriguez and Derek Jeter. Arod is notorious for putting business above all else. W illon to do whatever it takes to get what he wanted…now he’s with JLo and has a successful tv career. Wilson emulates Jeter off the field in promoting his business interests and keeping his private life intensely private. Shoot, he even makes his home guests check their phones at the door a la Jeter. – he orchestrated a fake baseball trade to the Yankees. – Brock Huard mentioned the other day that there is a part of Wilson that feels under appreciated in Seattle. Huard, a proponent of RW, didn’t get that from nowhere. -mostly though, why is Wilson the one doing this. Ryan, Rodgers, others, all could have played these games and leveraged the franchise tag. They didn’t. (Cousins doesn’t count) Why is Wilson the one doing this? I agree Rob. Soothing isn’t right. It just doesn’t sure well. Isn’t it hard to compare ARod and Jeter? Jeter is a loyal Yankees legend who always stayed fit and worked hard. ARod is a glory hound who relied on phenomenal natural talent, but who has a pea sized brain. (For one thing he was a Madonna toy boy for a while, and the internet has plenty of his idiocy on display.) RW is hardworking and talented and he has a drive to succeed that’s stratospherically above anything ARod had. I posted below but I meant to respond to you. Wasn’t trying to say Jeter and arod are the same, just saying he is friends with both of them. Also he is business partners with both of them. Respectfully, I’m not comparing the two. Wilson is known to be friends with both of them. If Giants for RW, is there a chance they’d try some kind of 3-way trade with Arizona for Rosen + picks? Compared to any QB we might draft, Rosen seems like a better prospect with some NFL experience and most of the salary advantage of a young QB. His makeup doesn’t seem a great match for the Hawks, on the other hand. My thinking is that NYG gets a sure thing QB with years to play, Arizona unloads Rosen to draft Murray, and Seattle gets a solid QB prospect, draft capital, and salary cap flexibility for upcoming free agents. Rosen is bad, will never be a top 15 QB. 1. It is possiblle Burns drops to 26. Bad vs run but add weight could help him. 2. Jeffery Simmons could go late 1st, and he could find argument that he is top 5 player. 3. Andre Dillard is best tackle in the draft and top 15 pick. 4. He is doubtful Savage gets out of the 30’s and he coul even go late first. 5. Rapp is 2nd round guy and pure box safety , just like Abram whou could sneak into late first. But smart teams will take Will Harris or Khari Willis for that role in 4th or 5th round. Trade down once and TAKE THIS MAN! No doubt Simmons is a very good player, but just can’t see the Hawks picking him early. Tough to pay a guy first round money to be in rehab all year long, with no chance to see how he fits in your scheme. He may have been a top 5 pick before the injury, but ACL recovery can be tricky and he may not be the same player a year from now. You lose a year of quality club control. Guaranteed no year one impact. Some teams just don’t draft these guys in R1 and I think the Seahawks are one of them. And one more note, he has Andy Issabella over Marquis Brown. Isabella over Marquise Brown “hands down” really surprised me. The medical concerns with Brown must be serious. We also have to remember Jim is very supportive of the Senior Bowl guys. What can you say, the man’s doing his job. Which 4 guys would or should be the players chosen? This would clear out a ton of cap space and truly reset the team for the next 4 years. As Rob has said, I don’t believe you get better by subtraction of blue chip talent, but if the doomsday button gets pushed, what happens? 1/24 – Byron Murphy – nCB – Replacement for Coleman. I would feel this is a pretty good “fill the holes” draft. But I’d probably try to trade back from 1/21 or 24 or 27 to gather more picks. If the team would hit the jackpot this could be one of the most disruptive and young fronts. I’m not a Grier fan, but he have some upside. And based on Rob’s comments Murphy could be special. There is zero need to reset the team for the next 4 years. A fresh SB window is opening with the current roster, there’s no reason to begin tearing it down. Is that supposed to be updated? 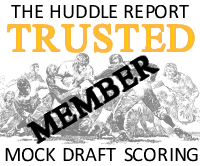 Either way, I honestly never pay attention to the rankings/draft grades on his site, just to the insider info. I think it will be updated few days before draft. We will see where they will end up. People all have different views. I wouldn’t read too much into it. But both will go earlier than that. Walterfootball is also low on them. I hate your reaction to rumors. Clark can’t be traded without signing the tag, which he would be a fool to do. Who cares what Del Rio says? My reaction has been consistently to say neither player will be traded before the draft. But to not bury my head in the ground when people like Schefter speak. If you just want flowers and kittens — or hot takes and massive, screechy overreactions — you’ve come to the wrong place. I am not sure what your issue is. There are rumors out there about trading Wilson, and Rob is addressing them. He has been consistently clear that he thinks neither get traded, but he is looking at the “what if” scenarios. If you don’t like it, that’s fine – not everyone agrees with everything – but try discussing it rather than just saying you hate something. I’d also say this to anyone who wonders why we talk about what we do. Rest assured nothing is done on a whim. I pour hours into this, never overreact. Everything is weighed up. And in the last few months what have we touched on? — Kyler Murray could and should be the #1 pick to Arizona (long before it became a realistic prospect and with many replaying that they’d never do it after drafting Rosen a year ago). — The Seahawks won’t have the money to make a splash in free agency (despite a lot of people suggesting otherwise). – The Russell Wilson contract saga will be the big talking point of the off-season (when strangely none of the local or national media were really talking about the pending issues). Indeed, props to you Rob for often identifying players and issues before the “bigger national” guys do! And most of us appreciate all the time and effort that you put into this labor of love. We say it all the time, but thanks again Rob! I look every day to see what new content awaits. I think possible targets for seahawks in first 3 round are DT, 5-Tech, FS/BigNickel, WR and OL. Rob, and others…which OL could be potential target on first two days? Who fits the most in Solarie’s scheme? Ford, Risner, Deither, Samia, Lindstrom, McGary, McGovern? I don’t think they will take an OL early. And exept Grier , who do you see as aerly (firs 3 rounds) pick for Seahawks? Seriously Reed for 2nd round. He learned the system and after few years and now delivering 10+ sacks and we part away for 2nd and take a chance. He still on rookie contract for a year to give similar performance or better. I’ll be honest: I don’t even care if Wilson is signed for a 45m APY 100% GTD contract or he’ll be traded for a decent compensation (early first round, second round and next year’s first and third for example)…just close this conversation already. I doubt Russ thinks he can get 45m APY fully GTD anywhere. I think he knows he’s maxed out at 40m APY and 80% or maybe 100% GTD 4 years. He won’t ever take 30m APY, so if the Hawks adamant to not give him more then they should just trade him. If they are not close to giving him 40m and Russ won’t take much less, trade him. If Hawks are fine around 35m and Russ can compromise a bit and take like 37m then meet half way and give him something like 36-36,5m APY. I’m not fan of fully GTD, but maybe Russ wants that. If Hawks won’t give him that and it’s a dealbreaker then trade him. If they can compromise and meet somewhere like 3 years fully GTD last year 50% GTD then do the extension. This year’s QB class is pretty mehh. If a team wants a proven franchise QB they should give up at least 2 first and 2 second. If they don’t have CAP then maybe send us players too. Jackson could start with Fluker while Iupati and Simmons could be pretty good backups. Carr could either start or be a hedge for the rookie. An OL with Brown, Jackson, Britt, Fluker, Ifedi would be good too. A secondary with Griffin, Flowers, McDougald, Savage, Hill. A big boy group of Dissly and Wesco and Dickson. Again…a huge risk…but some great potential too. Oakland don’t have the cash. The moment they sign Wilson to a new contract they have to put all the guaranteed cash in escrow. They wouldn’t be able to do it. We know Gruden would be interested in RW, but would Vegas really be the big market RW reportedly wants? The move will certainly be at the media forefront, but the sports market? Maybe betting makes a difference? Ditto for Arizona. Do you think RW would just take a big deal anywhere he can get it, or is it basically NY or bust if the Seahawks don’t pay up? Apparently it’s the reason they traded Mack. Simply couldn’t afford to put the guarantees in escrow. Wilson’s would be even bigger. Mayock must have been dying inside in hindsight knowing his team traded Mack away. I remember him being super high on him that draft. I guess getting to play around with 3 R1 picks his in first draft softens the blow a bit. Certainly they could get a bank loan. No? Maybe Davis needs to sell the team if he is this cash strapped. This is why they’re moving to Las Vegas. To try and make money. But selling a massive asset like a NFL team is like flogging the house you own outright simply because you can’t afford to by a brand new sports car. You need to be able to put money in an account, not a loan. The whole point is that you’re guaranteeing your money. If it’s a loan you’re not guaranteeing it. Yes — when you agree to terms with a player the guaranteed money has to go in escrow. So essentially, you have to be able to afford to sign a player to a mega-deal upon agreement. Or you have to be willing to part with tens of millions of dollars straight up. The owners hate this because they’d rather have the money in their account for obvious reasons. But that’s the way it works. So for Oakland to make a trade like this, Mark Davis would have to put about $100m in an account for Russell Wilson. Which is about as likely as Mark Davis deciding to have a respectable haircut. For most, that Carr is a non-starter (pun intended, although a true statement). #TCU DE LJ Collier, quietly pushing for the first round, spent yesterday and today with the #Lions and then he heads to the #Eagles and then the #Seahawks facility, source said. He’s booked solid through the 17th of April. That phrasing about “quietly pushing for the first round” and “booked solid through the 17th of April” have agent-speak all over them. I hadn’t really thought about that aspect of it before Rob mentioned it the other day. teams are probably glad the 1st round ends at 50 or so this year. Wow, just saw this video of Simmons training. Very smart of his team to publish this. Looks like a close second place to Trysten Hill to me as far as movement goes. Why in the world has the idea of trading RW to Arizona and/or trading for Josh Rosen come up multiple times in these comments?? Out of all the infinitely possible scenarios, that seems as far out as any. It’s pretty much nonsense, but I brought this up previously just as a quick idea. But Rosen is the exact opposite what PCJS wants. They wouldn’t trade Russ to a group rival. Only interesting thing could come by it to draft Murray. But won’t happen. Cards will trade their first pick for ‘Sunshine’ in 2 years anyways. For the life of me, I can’t understand why anybody would want Rosen on this team. The guy reeked of “bust” since before the day he was drafted and last season did nothing to change that. As Rob already noted, Nelson and Keke could be in play along with Omenihu. Green will get a shot this year and also remember that PC said Naz Jones will now be playing 5T. I wonder if that will have an effect on where they target this type of base DE? It’s clear that they’re looking for an upgrade at that position. Depends on how the draft falls as usual. I see that actually as tipping us away from 5T this year: we already spent a R3 on Green last year. Let’s see what he has to offer before we go spending another high pick on another one. I think they want a base end. Subtle difference. I could see that. I’d say they’d focus more on Edge, but signing Orchard and Marsh seems like a hedge for that. Maybe pass rushing 3T if they can get one? Just talking DL specifically here. I’m thinking DT as well, just because no worthwhile EDGE might be available. Rob could probably get me excited again about D’Andre Walker (forgotten man of this draft class so far…? ), but I am even cooling on Christian Miller a bit. Just not sure at this point who comes in and really makes a noticeable impact at LDE for us. They will add a guy with Dion Jordan size (275-280) to play base end. There are some options. You mentioned there’s a subtle difference between 5T and base end. Could you explain that a bit? My understanding is 5T is seen more as a run stuffing DE with minimal pass rush impact. Red Bryant is the extreme example of that. Are you envisioning the base end SEA is after as a guy who’s more stout against the run, but can still offer pass rush? Maybe like a Michael Bennett that can also kick inside and provide some pass rush if needed in the Nascar package? A five-technique is someone who’s more of a two-down DE who can do a bit of rushing but ultimately plays very disciplined run defense and provides solidity to one side. Dion Jordan had the size to do that but the physical upside to be a more dynamic threat as a pass rusher — and that kept him on the field for third downs. I think they’re looking for that type of DE. He proposes two three-team trades. Neither are likely. But the second one, if it was possible, would be more appealing. Three first round picks in 2019. But Oakland can’t afford Wilson. Unless Mark Davis robs a bank. 1st would be pretty stupid. It’s basically a Wilson for Murray trade (and some change). 2nd would be fine. I’d definitely take it on draft day (won’t happen then, just a thought experiment) if Murray wouldn’t be taken by the Cards and while the 49ers are on the clock, OAK would come with me with this trade. JLC is a hack that’s been caught fabricating things from the whole cloth on a number of occasions. The fact that fraud still has a job speaks to the low standards in the sports journalism industry. Wilson may be traded, but his thoughts on the matter are no more valuable than someone on Seahawks twitter or r/nfl. JLC has contacts in Seattle. Doesn’t change the fact that he’s a well documented liar. I don’t understand why people get so angry about reporters. I mean, there are levels of trustworthiness when it comes to reporters no? If a reporters known to fabricate stories, can you blame someone for being skeptical? Jason La Canfora has got plenty right on the Seahawks. All these accusations of fabricating stories. I’m not really interested in it. I don’t see the need to hammer journalists. I’m not interested in hammering journalists either. However, I also don’t see the need to absolve journalists of accountability entirely. If certain sources are wrong more than others than I will be more skeptical of it than other ones. Is that not a reasonable position to take? It is when we actually start talking about journalists who are consistently wrong. Fair. I don’t think it has to be so binary though. There’s degrees to it. I’m not the guy calling Canfora a hack or whatever, but I have seen misses from him. Moreso than other sources, so I will trust him less than those ones. Like you said though, he has also been correct on things, so I’m not discounting him entirely. I am also just a naturally skeptical person though. Can’t see the Giants giving up next year’s 1st (top 10 / lock) and this year”s high 2nd for Carr. I can imagine the Giants being in for Carr. Not sure on price though. Could be a R1. Maybe this year’s high 2nd (#37), next year’s 3 or 4. If I’m Las Oakland, I just keep my picks, deal Carr for a 2nd. They’re a long way from competing which makes paying for AB a perplexing move, IMO. Boy there’s a couple names that jump out at ya who will be in the green room beyond Day 1. Wait. This year there should be 46 names shouldn’t there? I think they should only invite like 15 players to the green room every year. It just makes it kinda sad when players are left over. I’ve really been enjoying the pods Rob, you and Brandan are a great combo! Thanks for doing those. Speaking of podcasts, I was listening to Move the Sticks yesterday and something Bucky Brooks said struck me. He mentioned that this time of year he’ll talk to his inside sources at clubs, but that he just assumes everything they tell him is a lie. I really feel like that’s the basis of all of these reports. Wilson’s camp and the Seahawks FO are both probably working the back channels trying to add pressure and get leverage. Even as a thought experiment, it’s hard to see what the possible trade partners would be. I can’t think of any team in the league that needs a QB and has the draft capital and cap space to pry Wilson away from the Hawks. It’s also hard to believe that we would either accept whatever sloppy seconds QB is on the team we’re trading with or take the risk of trying to draft a QB. Murray isn’t getting past AZ, Grier has upside but nothing to bet the farm on, and the rest of the QBs this draft are meh incarnate. I’m still wondering if it’s not 100% impossible the Cards pass on Murray, unless the Redskins or someone offer their R1 pick for Rosen. If they traded Wilson they would add a veteran, possibly Jacoby Brissett, to the competition. But it’d be an open competition. Murray is a lock for #1. You don’t get this far. Rosen has zero weight in the Arizona locker room now. As long as we end up with Murray I’d be fine trading RW. I doubt it is doable but every time I watch Murray play QB I think he could exceed what we have seen from RW. It’ll take a lot more than that. Plus Miami are in a big rebuild. We can count them out. I’m not sure Seattle is in a position to demand much more than that at this point. They would get a serviceable (if not spectacular) starting qb in return, have 3 picks in the top 48 of this years draft, ample cap room to sign the rest of their pending FA’s (BW, Frank, etc)..and lots of ammo for next years qb rich draft. As for Miami being in a rebuild..well..what better way to start your rebuild than with a top 5 qb?? Unless they look forward to endless years of 7-9 purgatory..
probably won’t happen..but wanted to offer an alternative scenario to the usual Raiders, Giants, etc speculation. They’re not going to deal for Fitzpatrick. They would get more picks than that. Miami are building the lines this year and adding a QB next year. Getting a QB now would be futile. They have nothing to build around him with and won’t if they trade all their picks and give him $100m guaranteed. If it happened I think it’d be next year, to the Giants, after drafting someone this year and/or signing Brissett as a FA. I agree there is a lot of smoke in this whole ordeal. Its been said around here before but i think that a lot of the intrigue for this situation has been that like Russ himself, its weird. No one has made such an odd contract deadline before and given people so much to talk about during a football dead period. I don’t think Schefter is a puppet or a ratings hog but i do think he is being fed information. He is a journalist with intel that most don’t have. Of course he would be happy to report it every chance he gets. I’m not a body language expert but I’m guessing he is excited. I believe pride is playing a big role in all this. Not just for Russ who may feel under appreciated but mostly of his representation. The odd tactics and all out media blitz stinks of vengeful business by his agent and other reps that wanted to bring the MLB style big money to Russ the first time and got checked. They want to see Seattle sweat. Leaking info, planting questions, playing a lot of games. If it was just about money I think it would both side would have a resolution in mind already (for better or worse). This is about making a point, whatever that may be. Rob – it’s got to be tough being a journalist these days. The public is so anxious for instant news that the fact that there is no news becomes news. Then, folks jump in to speculate about what it means that there is no new news and their speculations become “news”. Let’s all be careful to remember that the negotiations between RW and the Seahawks are being held confidentially, and what people are saying about them is largely speculative. For some folks, it’s fun to play the “what if” game, but after a while, some folks have trouble remembering that the “what ifs” are not based on the facts available. Adam Schefter doesn’t deal in lazy speculation though. Jack Del Rio isn’t a journalist. I’ve been saying for weeks I don’t expect any trades before the draft. But I think some people are in danger of wishing this away because it’s uncomfortable to listen to. Neither Schefter nor Del Rio is a party to the negotiations, so they have no first-hand knowledge of what is actually happening. I assume each is paid for voicing opinions and I have no quarrel with that. I just think that some people like to deal with facts and others like to deal with speculations. And, I think there are important distinctions between facts and speculations. Schefter is as connected a journalist as there is in world sport. If you think he’s just tossing stuff out there on a whim, he isn’t. Sounds like you want the last word — but at the risk of incurring your wrath, let me point out that you used the word “speculate” in the title of this post. If you think that Schefter’s comments are more than that, then maybe we disagree. He is speculating. But just because he’s speculating doesn’t mean he isn’t speaking from a position of knowledge. I’ve done it loads of times. I know what’s going on — I want people to know I know what’s going on — but I can’t spell it out for various reasons. You seem to be implying he’s just shooting from the hip. And Phil — it’s nothing about ‘needing to have the last word’. It’s a discussion. It’s OK to actually reply without being accused of wanting the last word. I think there’s a serious difference between “tossing things out on a whim” and being used by the same sources he’s so connected to. No one is saying Schefter is just making things up, just that the connections feeding him info are doing it as a calculated move. Schefter is not being ‘used’. You’ve got to be joking. Have you not been paying attention the last month? The “Ciara likes New York” leak. For sure there’s parts of this negotiations we’re not privy to, but let’s not kid ourselves. These are tactical manuevers by both sides. A chunk of this negotiation is being played out right in front of our eyes. It’s being played out in full through the media. You’re right cha — not a shred of this is being done with confidentiality. All right, I gotta bite …. ” If not a shred of this is being done with confidentiality”, then I would be interested in what RW is asking for and what the Seahawks are offering. Then I can decide how concerned I should be about the differences between the sides and how concerned I should be about the Seahawks need for someone other than Paxton Lynch as the next QB. Absent that information, I’m not going to spend much time trying to interpret what RW says on Fallon or what Ciara is purported to say about liking New York, or what the latest speculations are from those who think they may have inside information but can’t tell me their sources. Wilson wants several things. Percentage of the cap regardless of its number, full guarantees, record setting numbers. Either a combination of these or all. That’s been made very clear by Mark Rodgers through the media. That’s cool. Looking at chart, first pick will be defense DB or DL & WR /TE being second. Rob, you dont agree with this? Drew Lock has grown on me a lot. No I don’t. Will Grier and Kyler Murray are better downfield throwers. But I’ve not studied Lock as closely. Tyree Jackson another 6’7″ Monster armed Statue. Have you watched his tape? I was thinking of toying with a mock seeing what we could get from a Giants RW trade and going budget QB this year Lynch/Jackson. I’d be scared to death taking him early. I would only take him 5th or later. Why would a rebuilding team even want wilson? A 30 year old QB who wants to be paid the highest in the league by a good margin but has a bad habit of miserably slow starts to seasons and hasn’t won a playoff game in two years? Seriously I feel like every year the Seahawks fandom is complaining about wilson until a couple weeks in when he starts to warm up. He’s a great talent but at that age and price tag, not to mention the capital you’d have to give up, you better be REALLY good. It’s a 1-year, minimum deal. Austin Seferian-Jenkins planned to wait, then the Patriots stepped in. He picked NE over the #Seahawks. The private visits mean nothing.